This year did not start well for us, actually 2015 ended bad with Lucky passing away, and then 2016 started with Bibi passing away. Needless to say that we have been very sad. With Christmas rush over we also did not have the sales to keep our minds occupied, which did not do our moods well. With all this we have not been very motivated in general which causes for a circle as not being motivated is pretty depressing too. Then last week we discovered a lump on Simon, pretty big and pretty scary as it must have grown fast, we wash our dogs regularly so I notice such things pretty quickly. He had a biopsy on Tuesday and was diagnosed with cancer. A not very aggressive skin cancer, but no cancer is friendly. We had him operated on Friday and a total of 4 lumps were removed. The survival rate is pretty high of this type, so we hope that Simon will stick around for a while, we are not ready to loose yet another family member. 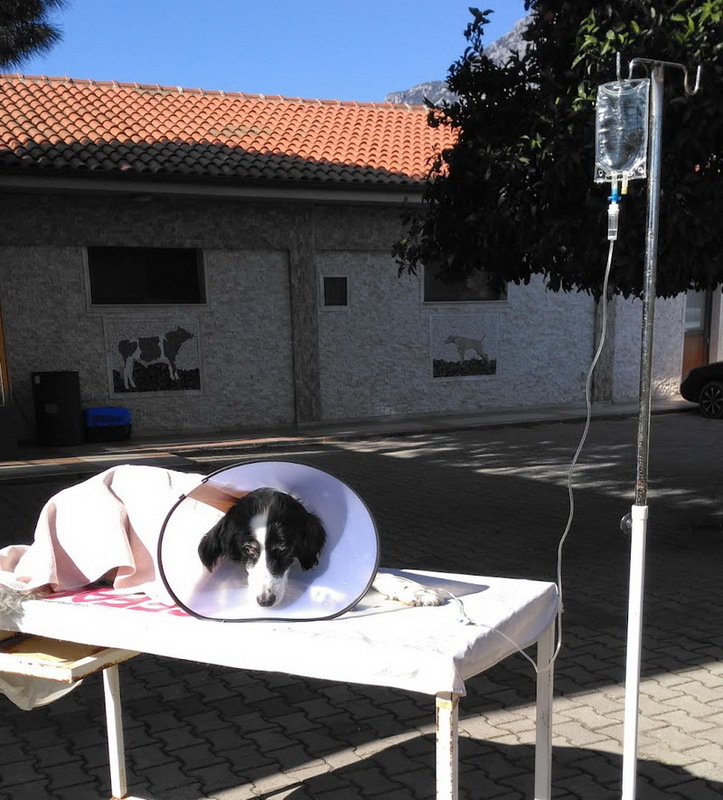 Here he is in the garden of the animal hospital waking up in the sun right after surgery. With all this we have vet bills piling up, so we are having a sale in our Supply shop in hope to help a bit with the costs, use the code DOGGY20 during checkout and you will get a 20% discount. We have a flat rate shipping of 5$ for no matter how many items (except the fabrics due to weight). Of course any sale in any of our shops is very much welcome StaroftheEast, StarDelights, StarBags, StarsWear and StarHomeStudio. With all this going on I have not been able to finish my January projects. Only the piano stool got finished, the two chairs are still in the same condition and the walls still need to be painted. The fact with all this that I burned my right arm with boiling oil, and strained my left wrist while carrying Simon is not helping either. Before my arms got injured I did manage to finish the weekender I showed 10 days ago. And I started and finished a little furniture piece in between. It started as a very sad and ugly nesting table (without the rest of the nest). There clearly used to be wood between the legs but those were gone. It has a dark brown ugly color (no offense to those who like this) which I very much dislike. And you could clearly see that it was suppose to be part of a set because of the grooves. I started with sanding the wood and filling up the grooves with wood and wood paste. I then varnished it with sanding sealer, sanded it again and then applied several layers of white acrylic paint to give a nice base. I knew right away what I wanted to add to the legs, driftwood! I choose strong but natural wiggly looking pieces to make it clear that they are driftwood. Coming together nicely, don't you think? I then painted everything (except for the top) a sea green color. And for the top I used a Vintage map of Istanbul. As the top was not entirely flat but had a rounded border, cutting the map turned out to be a challenge for me, but I eventually managed to make it straight, unlike the detail you see above. After varnishing and sanding the top many times (I lost count), I am very happy with the result! The entire table and the driftwood was varnished too to make it waterproof and wipe-able. No sign of the once-upon-a-time-it-was-an-ugly-nesting-table. The cute end table is available in our StarHomeStudio shop where you can see and read more details about the table. As for February projects, well I will need to finish January's projects and I won't add anything else to that list as my arms need to heal first. 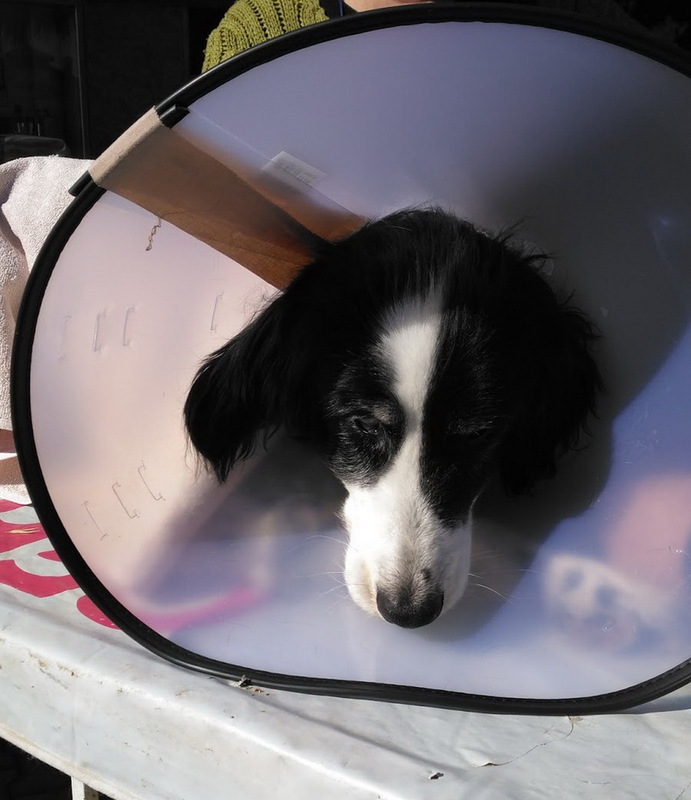 I also hope that Simon will recover quickly the 'cone of shame' is driving him nuts and for us it is the 'cone of pain' as he keeps bumping in to us with it. Please send us some positive vibes, we really need it! Sending positive thoughts and hugs for Simon's recovery. Your new project: you' re doing miracles with your hands!!! Sorry to read about all the bad luck you've had these months and I hope it's going to be better soon. Try to do something fun to put your mood in a better place. On another note, I love that table! so cool! Poor Simon, he looks pretty miserable there. I hope he still stays with you a looooong time. The table is absolutely lovely! Sending more positive thoughts for Simon and wishing you a great month of February. The bad luck must end sometime, so let it be very soon. The stool looks amazing, I could not believe how very different it looks. Healing vibes for Simon! And many wishes for a good February. The table turned out great, love the map detail! Sending many positive vibes your way, hope to see more happy creations, and happy doggies! Healing vibes to Simon! Positive thinking only!!! Sending lots of positive vibes from over here as well and also a speedy recovery for Simon! Keeping yourself busy is what i would do as well and seeing how you can do such miracles from old and unusable things, you're definitely doing it right! Going to share your post on Twitter as well, so here's for many happy sales!